In this article, Blackburn and coauthors examine the direction of nutrition support in the ICU with particular emphasis on the current and future role of PN support for critically ill and surgical patients. 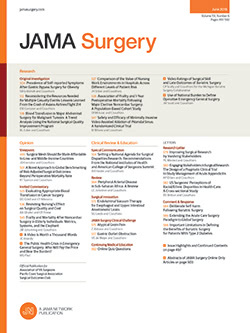 Blackburn and coauthors suggest that (1) nutrition support in the ICU is a challenging and complex endeavor that requires a coordinated team of physicians, nurses, dieticians, physician's assistants, and pharmacists and (2) PN provides an important option in critically ill patients who cannot be fed by other means. Blackburn and colleagues provide a nice history of PN and the issues surrounding its use and application. They hypothesized that TGC might improve morbidity and mortality in parenterally fed patients.